"NB: Administrative Law and Administration Practice"
"Conflict Studies / nota bene"
"International Law and International Organizations"
"Software systems and computational methods"
Danilenko D.V. - Why Russians are so different? Many facts and indexes allow us to affirm that Russia and Russians are not so different form the Westerns countries and their citizens. Russian society is complex, multinational, and urbanized. The level of education is quite high here, and literary as well as artistic legacy of Russia is considered as being a part of Western culture. Welfare state and social justice values, especially labor rights developed under the Communist rule, have strong legacy in Russia, which also seems to confirm the idea that the levels of certain human development indexes are comparable to that of the Western countries. The level of equality between men and women is not lower than in the Western countries. Nonetheless, some socioeconomic and political peculiarities of Russia as well as of the cultural identity and worldview of Russians are so important, that even a tourist can observe significant differences in comparison with the Western countries. Indeed, the democratic organization of political power has never existed here; human rights abuses are common here even today; level of social capital is the lowest in the world, even on the level of most intense interpersonal relations; and economy is still struggling to convert to capitalism, among other things. 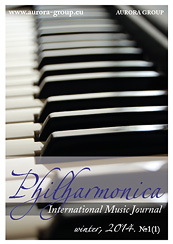 The first issue of «PHILHARMONICA. International Music Journal» №1, 2014 is published! All articles are written in both Russian and English. The journal is available online in our library. The second issue of "Sententia. European Journal of Humanities and Social Sciences" is available online!